Baking powder is one of those ingredients that have an annoying habit of not being in your cupboard when you need it. Brown sugar is another example. But unlike brown sugar, which you can easily distinguish from granulated white sugar, it's not at all apparent how baking powder is different from baking soda. This can make it tempting to substitute baking soda in a recipe that calls for baking powder. Or vice-versa. Either way, big mistake. What Are Baking Powder and Baking Soda? Baking soda and baking powder are leavening agents that make your baked goods rise. Baking soda is alkaline, so it's activated by combining it with an acid like vinegar — or, more commonly in baking, buttermilk. When that happens, it produces CO2 gas, which gives your muffins their lift. Baking powder works similarly because baking powder is simply baking soda plus some sort of acid ingredient mixed in. As long as the powder stays dry, the two ingredients remain separate. But once you add a liquid, the acid and alkaline ingredients combine, produce CO2, and you're off to the races. Different brands of baking powder use different formulas, and they don't all use the same compound as the acid component. But one of the acids that are commonly used is cream of tartar. Which happens to be an ingredient you can buy in the spice or baking section of nearly any grocery store. And that means, as long as you have baking soda and cream of tartar, you can make your own baking powder in just a few seconds. Unfortunately, if you don't have baking soda or cream of tartar, you're going to have to go to the store. While you're there, you might as well pick up all three items. Just make sure you replace them every six months, or they'll lose their potency. But whatever you do, don't try to substitute baking soda for baking powder. It's won't work. 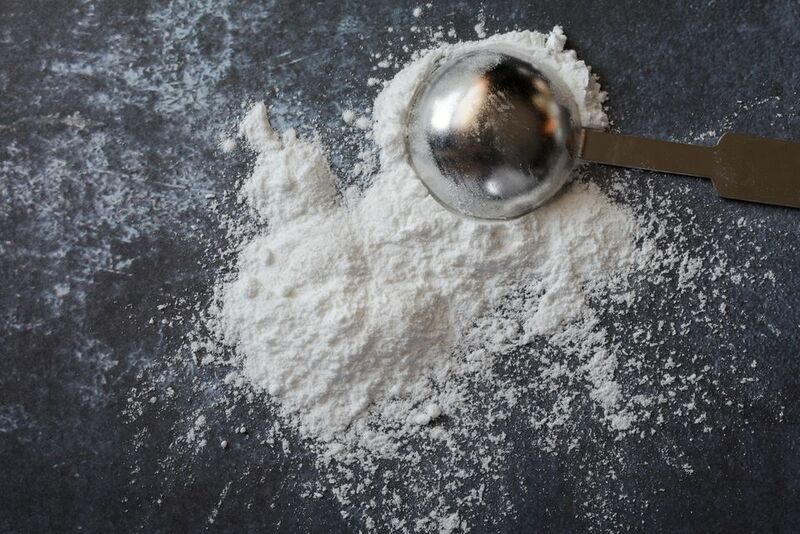 Here's an article that discusses the difference between baking soda and baking powder. Measure 1 teaspoon baking soda and 2 teaspoons cream of tartar into a bowl. If you need more, you can just double the recipe. If you need to store it for some reason, just add a teaspoon of cornstarch (so that it doesn't clump up), and store it in an airtight container. One thing to keep in mind is that when you make your own baking powder this way, it will be single-acting only. What does this mean? Most commercial baking powders are double-acting, because they release some of their gas as soon as the wet ingredients and the dry ones come together, and then the heat of the oven or griddle triggers the release of still more. This is why you can (and should) let your pancake batter rest for 20 minutes to give the lumps a chance to dissolve. With homemade baking powder, however, there is only one release of gas, when the ingredients are mixed, not during cooking. That means you don't have the luxury of letting your batter sit out. Rather, once you get it mixed, you need to get it into the oven right away. Therefore, a homemade baking powder is best for quickbreads and muffins and the like, rather than pancakes or waffles. It'll still work for pancakes and waffles, but you have less leeway when it comes to letting the batter sit while you cook.